This is the first of three posts on social media supporters of New Zealand public libraries that will be published over the coming three weeks. According to Neilsen’s 2010 Social Media Report, 1.8 million New Zealanders are interacting via social media sites. 79% list Facebook as their main social networking platform up from just 19% in 2007. Twitter is also gaining traction with 11% having a Twitter profile and 44% of these following company’s or brands. So with social media participation occurring at such a rapid rate, how do New Zealand Libraries fare? I decided to find out, by evaluating our public libraries’ support amongst the two most popular social media networking sites – Facebook and Twitter. I used the list of public libraries found on Public Libraries of New Zealand, and then systematically searched both Facebook and Twitter for organisation accounts to determine the number of “likes” and “followers” respectively. The image above provides a crude count of social media supporters split between the North and South Island (nothing wrong with a bit of rivalry :)). Auckland Libraries, the largest public library system in New Zealand, ranks 3rd in the number social media supporters against libraries in the North Island. Perhaps this is to be expected, given that they have recently transitioned from multiple library systems into one giant supercity. Although, I don’t know if they would have fared any better in pre-supercity times. Palmerston North City Libraries has a solid number of supporters, but South Island public libraries are leading the way. 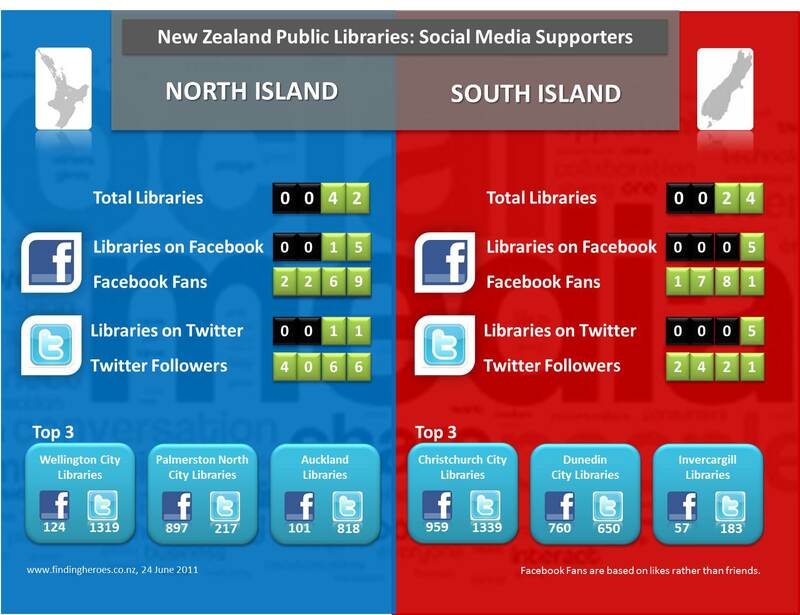 Although small in number, they have a greater average following of social media supporters than North Island libraries. Less than 30% of New Zealand public libraries have a Facebook presence, and fewer than 25% have a Twitter presence. I’m disappointed (but sadly not surprised) by the overall number of social media supporters, suggesting that most libraries have dipped their toes into the water without an overall strategy, implementation plan, or monitoring process. Do these numbers reflect your expectations? Next week: Social Media Supporters by individual public libraries. The National Library sponsor the World Internet Project which is undertaken by a team at AUT University. You may like to look at the reports which contain some information on Social Networking sites. I think the second report is particularly pertinent as it looks at use of social media networking sites by New Zealanders. somewhat surprised. I expected 60% with a facebook presence. In fact my expectation was that a bit like blogs, many libraries would have created a facebook page, then after some enthusiastic posting, neglected it. What I would be more interested in is how libraries are using social networking sites. Are there some patron interactions that work really well with facebook? I also thought the same Mark, and it wasn’t until I checked that I realised my assumption was wrong.